Michael joined ACE at the young age of 14 and has been a member ever since. He grew up in Ft Myers and then moved to the Tampa Bay Area in 2007. He currently works as a Senior Business Analyst for the cable company, Spectrum, and specializes in Call Center Workforce Management. He holds a Bachelor of Science Degree from WGU for Business Mangement and an Associate of Science Degree from ITT Tech for Computers and Electronic Engineering. In his spare time, he enjoys taking trips to the Orlando parks with his wife, Shannon. Out of all of the excellent coasters in Florida, Mako from Sea World hits top marks and is his favorite coaster in the state! 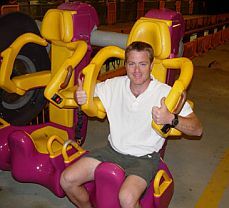 Chris resides in the Orlando area (believe it or not a native), better known as the theme park capital of the world. He currently works as an IT consultant. He has been an ACE member for 25 years, the last 13 as regional rep. His first ACE convention was the Kennywood Convention in 1991. He FINALLY got to ride the Coney Island Cyclone during the 2007 ACE Preservation Conference after two previous failed attempts thanks to bad weather. In his spare time he visits the local theme parks and collects Disney memorabilia. He holds a BSBA degree from the University of Central Florida. Robin joined ACE in 2003. 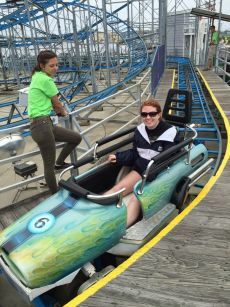 Growing up in New Hampshire afforded her the opportunity to experience some of the great coasters in the Northeast. After graduating from the University of New Hampshire, she moved to Florida. She currently works in Quality Assurance for a medical device company. Her first ACE event was CoasterCon XXVI in Virginia and since then has enjoyed many ACE events. In her spare time she enjoys visiting the local theme parks, reading and going to concerts. Soon she hopes to visit some of the great parks "across the pond". Growing up in Sault Ste. 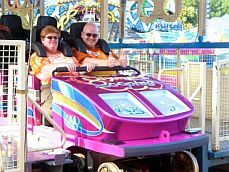 Marie, Ontario, Jeff caught the coaster bug on Scooby's Ghoster Coaster at Canada's Wonderland. The first coaster he rode with his soon-to-be wife, Janna was the Wolverine Wildcat at Michigan's Adventure. After getting married, they joined ACE in 1995 and attended their first ACE event: Spring Conference at Michigan's Adventure in 1998. They have attendened too many events to count since then and loved them all. Jeff works as a software developer at Spok, Inc in Jacksonville. He holds a BS degree in Computer an Mathematical Sciences from Lake Superior State University. Janna grew up in western Michigan, and visited Deer Park Funland (now Michigan's Adventure) often as well as many trips to Cedar Point. Wolverine Wildcat at Michigan's Adventure was Jeff and Janna's first coaster together. After getting married, they joined ACE in 1995 and attended their first ACE event: Spring Conference at Michigan's Adventure in 1998. They have attendened too many events to count since then and loved them all. Janna currently works as a software engineer for Werktek in Ponte Vedra. She holds a BS degree in Computer an Mathematical Sciences and Mathematics from Lake Superior State University. Maddy has been a lifelong ACE Member, with 2018 being her first year being Assistant Regional Rep, following in the footsteps of her dad, Chris Kraftchick. She currently lives in Kissimmee, right down the road from Disney, SeaWorld and Universal. In her spare time, she can be found visiting the local theme parks with her friends and family. She holds a BA degree in Public Relations with a minor in Hospitality Management from the University of Central Florida.